This is the ultimate party tent for your outdoors events. This kit has everything needed to be fully functional and is built to endure multiple set ups and take downs for both commercial and industrial use. The tent features 2" seatbelt webbing around the entire perimeter and side poles that are light weight and extremely durable. The center and quarter poles each have a plate welded on the top and bottom, and a heavy duty pin welded into the top. The tent top, which is made of heavy-duty "Block Out", and sides come rolled in a protective bag. The tops are available solid white and white with red, blue, green, or yellow vertical stripes. The tent is approximately 70' L x 70' W. The tent is NFPA 701 certified and has a 1-year manufacturer's warranty. This is too big. Can I get a 20 ft. by 70 ft. by 15 ft. high canopy? Unfortunately, we do not offer a 20 x 70 pole tent at this time. The closest option is a Premier West Coast 20 X 60 Frame Tent. 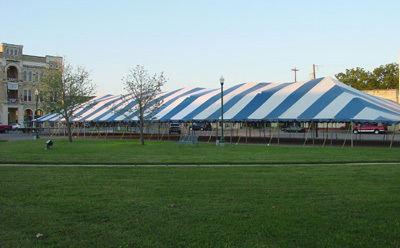 This tent has a standard roof pitch, bringing the peak height to 13 feet.